a small node that is solid and can be detected by touch. Albini's n's gray nodules of the size of small grains, sometimes seen on the free edges of the atrioventricular valves of infants; they are remains of fetal structures. apple jelly n's minute, yellowish or reddish brown, translucent nodules, seen on diascopic examination of the lesions of lupus vulgaris. Gamna n's brown or yellow pigmented nodules seen in the spleen in certain cases of enlargement, such as Gamna's disease and siderotic splenomegaly. 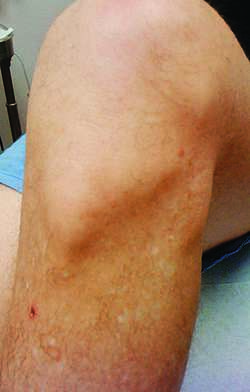 Jeanselme's n's (juxta-articular n's) gummata of tertiary syphilis and of nonvenereal treponemal diseases, located on joint capsules, bursae, or tendon sheaths. 2. a small dense accumulation of lymphocytes found within the cortex of a lymph node, expressing the cytogenic and defense functions of the tissue. Called also lymph or lymphatic follicle. milker's n's hard circumscribed nodules on the hands of those who milk cows affected with cowpox. rheumatic n's small, round or oval, mostly subcutaneous nodules made up chiefly of a mass of Aschoff's bodies and seen in rheumatic fever. surfer's n's hyperplastic, fibrosing granulomas occurring over bony prominences of the lower limbs and feet as a result of repeated trauma from kneeling on surfboards. typhus n's minute nodules produced by perivascular infiltration of polymorphonuclear leukocytes and mononuclear cells in rickettsial disease; they were originally described in typhus. nodule of vermis the part of the vermis of the cerebellum, on the ventral surface, where the inferior medullary velum attaches. vocal n's (vocal cord n's) small white nodules appearing on the vocal cords in chorditis tuberosa with excessive use of the voice; called also singer's nodes or nodules and teacher's nodes or nodules. A small node; in skin, a node up to 1.0 cm in diameter, solid, with palpable depth; a pulmonary or pleural lesion seen on a radiographic image as a well-defined, discrete, roughly circular opacity 2-30 mm in diameter. Compare: mass. Albini's nodules gray nodules of the size of small grains, sometimes seen on the free edges of the atrioventricular valves of infants; they are remains of fetal structures. apple jelly nodules minute, yellowish or reddish brown, translucent nodules, seen on diascopic examination of the lesions of lupus vulgaris. nodules of Arantius see under body. Aschoff's nodules see under body. Bianchi's nodules bodies of Arantius. Brenner nodules nodular masses of tumor in the cyst wall in cases of Brenner tumor. Gamna nodules , Gandy-Gamna nodules brown or yellow pigmented nodules sometimes seen in the enlarged spleen, e.g., in Gamna's disease and siderotic splenomegaly. juxtaarticular nodules gummata of tertiary syphilis and of nonvenereal treponemal diseases, located on joint capsules, bursae, or tendon sheaths. Lisch nodules hamartomas of the iris occurring in neurofibromatosis. 2. a small, dense accumulation of lymphocytes within the lymph node cortex, expressing tissue cytogenetic and defense functions. Morgagni's nodules bodies of Arantius. rheumatic nodules small, round or oval, mostly subcutaneous nodules similar to Aschoff bodies; seen in rheumatic fever. rheumatoid nodules subcutaneous nodules consisting of central foci of necrosis surrounded by palisade-like coronas of fibroblasts, seen in rheumatoid arthritis. Schmorl's nodule an irregular or hemispherical bone defect in the upper or lower margin of the body of the vertebra. triticeous nodule see under cartilage. typhus nodules minute nodules, originally described in typhus, produced by perivascular infiltration of polymorphonuclear leukocytes and mononuclear cells in typhus. vocal cord nodules singer's or teacher's nodes; small white nodule on the vocal cords in those who use their voice excessively. nod′u·lar (nŏj′ə-lər), nod′u·lose′ (-lōs′)(-ləs), nod′u·lous (-ləs) adj. 2 a small nodelike structure. The most commonly used medical term for a small node, bump, swelling, or protuberance. A small node, bump, swelling, protuberance. See Apple jelly nodule, Cold nodule, Hot nodule, Pseudorheumatoid nodule, Renal nodule, Rheumatoid nodule, Satellite nodule, Sister Mary Joseph nodule, Solitary thyroid nodule, Surfer's nodule, Tobacco nodule, Typhoid nodule, Warm nodule. 2. A small cluster of cells. A group of unencapsulated lymph nodules, such as Peyer's patches of the small intestine. The jelly-like lesion of lupus vulgaris. Lymph nodules located in the cortex of a lymph node. A mass of compact, densely staining lymphocytes forming the structural unit of lymphatic tissue. These nodules may occur singly, in groups (as in Peyer's patches), or in encapsulated organs such as lymph nodes. Each contains a lighter-staining germinal center where new lymphocytes are formed. Small round density, 1 to 5 mm in diameter, as seen on the chest radiograph (e.g., in disseminated tuberculosis). Painless smooth or warty lesions due to a poxvirus that is transmitted from the udders of infected cows to the hands of milkers. Subcutaneous nodes of fibrous tissue that may be present in patients with rheumatic fever. See: subcutaneous nodule for illus. Small brown nodules seen in the spleen and other organs and consisting of necrotic tissue encrusted by iron salts. An isolated nodule of lymphatic tissue such as occurs in mucous membranes. 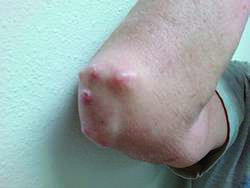 Small, nontender swellings resembling Aschoff's bodies and found over bony prominences in persons with rheumatic fever or rheumatoid arthritis (in rheumatoid arthritis, they are called rheumatoid nodules). Nodular swelling and possible bone changes of the area of the lower leg and foot exposed to pressure and trauma while on a surfboard. The nodules may be painful. A visible or palpable mass in the thyroid gland, benign about 90% to 95% of the time. A history of radiation to the head or neck increases the likelihood that the lesion will be malignant, as does the appearance of the nodule in the first decades of life. Fine-needle aspiration biopsy is the first and often the definitive diagnostic test. Nodules characteristic of typhoid fever and found in the liver. Small nodules of the skin seen in typhus. They are composed of mononuclear cell infiltration around vessels. A small, solid knot-like lump of tissue occurring anywhere in the body. Nodules in the skin are easily felt. The term implies nothing about the nature of the lump. short for root nodule. (see NITROGEN FIXATION). A swelling or knob that may form on a tendon and make it difficult to slide smoothly through its sheath. A small, circumscribed mass of tissue or an aggregation of cells. Busacca's nodule's Nodules often found in the iris stroma of an eye affected by granulomatous uveitis (up to about 30% of cases). Syn. floccules of Busacca. See iris nodules. Dalen-Fuchs nodule's Multiple, small yellow-white mounds consisting mainly of epithelial cells protruding through the retinal pigment epithelium. They are seen in the fundus of an eye with sympathetic ophthalmia, Vogt-Koyanagi-Harada syndrome or some other granulomatous inflammations. iris nodule's Small, solid elevations found on the iris and epithelial cells and lymphocytes. They are usually whitish or grey, depending on their location. See Busacca's nodules; Koeppe's nodules; Lisch nodule. Koeppe's nodule's Small nodules frequently found on the iris around the pupillary margin of an eye affected by granulomatous uveitis. See iris nodules. Lisch nodule A small, abnormal, lightly pigmented swelling which develops on the surface of the iris in almost all patients with neurofibromatosis type 1 during the second or third decades of life. See von Recklinghausen's disease. 1. A small node; in skin, a node up to 1.0 cm in diameter, solid, with palpable depth. 2. A pulmonary or pleural lesion seen on a radiographic image as a well-defined, discrete, roughly circular opacity. n a small solid mass or knot that can be easily felt. n.pl See also cyst, palatal, of the newborn. a small boss or node that is solid and can be detected by touch. groups of small masses of lymphoid tissue. In the intestinal mucosae they are peyer's patches. see semilunar valve nodule (below). a small mass of fibrous tissue in the center of the free edge of each semilunar valve. Called also nodule of Arantius. the part of the vermis of the cerebellum, on the ventral surface, where the inferior medullary velum attaches.